I hope you can help me find a way to finish a stash of blocks I found in my mom's house. She passed away last July and I found a few dozen blocks she apparently made and hand quilted in a "quilt as you go" fashion. So, there are 14-16 inch blocks quilted through the 3-layers (not trimmed). How to I connect the blocks? Sorry if it is a lame question, but I am a not-very-experienced quilter when it comes to techniques. Thanks in advance for any suggestions. Depends on whether or not they are compatible and all the same size, and howmany, and what style they are. A photo might help. Do you want sashing? or Not? There are QAYG methods with sashing, and without. This graphic may give you some ideas of a methods you might use. Please think outside this box and come up with alternatives that suit your process. You could piece all the blocks together with either method, then apply the sashings as long strips. 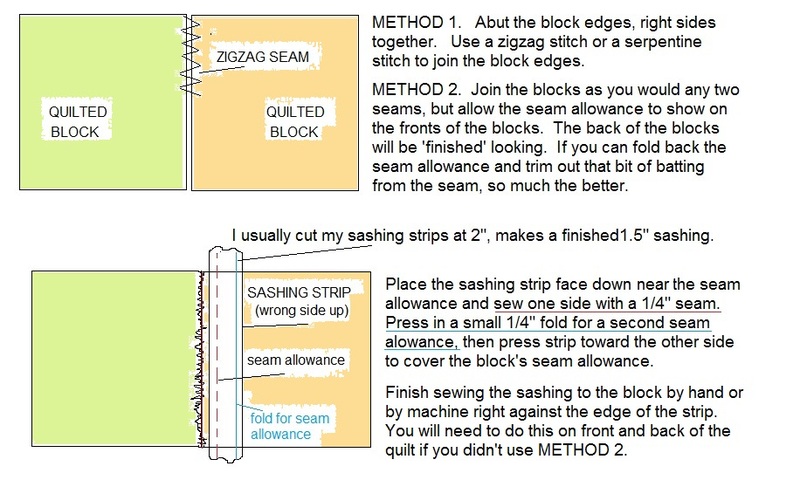 Or do individual blocks with sashings on two sides, then add long sashing to join the rows of individuals together. You may even come up with another way to hasten your process or one that works better for you. I envy you the chance to work on your mom's blocks. I taught my own mom to quilt and I was the first quilter that we know of in 5 generations of my family; no unfinished treasures to love and cherish. Thank you, Maggie_Sue, but this is a really easy accessory program that comes on most PCs, called Paint. I can do wonders with squares, rectangles, and triangles, but the curves and squiggles are a bit more trouble. Anyone can do this! I just happen to have the time and do it often. Another possibility would be making a "potholder quilt" where you first bind all the blocks separately, then sew together. I have only seen one of these type of quilts, but did like how it looked. Here is link to an article on the Marcus site about this type of quilt. Last edited by patchsamkim; 06-22-2013 at 02:33 PM. Wonderful to know they were so advanced quilters in those times. I'm 68 and first I've heard of a potholder quilt. I learn so much on this board all the time. Thanks for the link. Why not make plain blocks to fit between the ones you have to make a say 20 block quilt. You possible need to square them to same size. That sounds like great idea to me. Plus, then it'd be a "mother-daughter" project, even though your mom's no longer living. I have a few projects my mom & I have done together that I will treasure when she's gone. Thank you for the short tutorial. checkout utube tutorials, they have great tutorials for exactly the type of quilt as you go blocks. My mom quilted that way all the time. She sewed the fronts together (RST) and when she did that, she pulled the backing and batting away; then she turned one side of the backing over the other side and hand stitched the backside seam. I think she may have trimmed the batting and one side of the backing to make it smooth as there was never any lumps or bumps on the back of her quilts. In fact she prided herself in having the back look as nice as the front!! Her hand quilting was amazing....very tiny stitches.....I haven't reached that point yet!! hey Maggie sue I agree with you. Jan has helped me out with her posts more than she know. Jan I always read what you say in your posts! i am someone who is teaching myself to quilt and your posts have helped me a lot. I love this Board because of the sharing of quilting and so much more! Thanks to all of you out there, this sharing of info is a God send! Basically, you stitch the fronts (right sides together) and make sure you don't catch the batting/backing in the seams. Once the top's seams are together, you will smooth out the batting and trim to fit if needed (my mom in law just overlapped hers...it was a real thin batting). Once she had the batting smooth...she had used a blind stitch to secure the backing seams (same blind stitch you would use to hand bind a quilt). Her friend, just sewed the backing (wrong sides together), trimmed the seam allowance, and hand stitched a bias binding over the seams (made from the backing material). I liked Mom Beck's better...you could hardly tell where it was seamed. WOW Jan. I only use Paint to get fabric I scanned loaded into my Electric Quilt program. Have to look into Paint and see what this old dog can learn. THANKS!! !